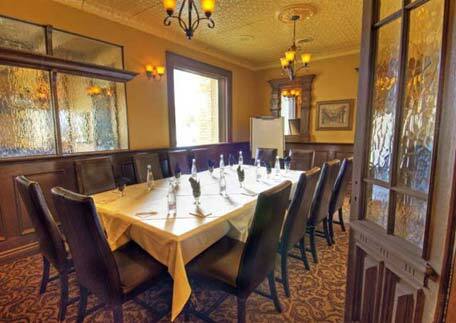 The Parlour Inn’s Windsor Room is the ideal venue for your next event or meeting. The Windsor Room can accommodate up to 20 people and has a cozy, elegant aesthetic that will enhance any event that takes place there. This space is perfect for smaller and more intimate events like team meetings, sales strategy meetings, small corporate retreats and even family gatherings or small wedding receptions. The intimate space will allow for team collaboration and the dedicated work space you require to have a productive event. We are happy to offer many different catering options at the Windsor Room, from snacks and beverages to full 3-course meals. You will have the option of having working lunches or full breaks, whichever you feel with best enhance your productivity. Our custom catering promises to appeal to different tastes and palettes with gourmet foods that are prepared in our on-site restaurant, The Parlour Steakhouse. The centrally-located hotel is located in the historic downtown of Stratford, home to the beloved Stratford Festival. What sets The Parlour Inn apart from other hotels that offer event spaces is its distinctive beauty and charm. When you host your next event here, you will be sure to impress all your attendees with its lovely atmosphere, attention to detail and exceptional customer service. You’ll also have the option of booking rooms in the hotel should you desire to stay overnight and have a relaxing evening. 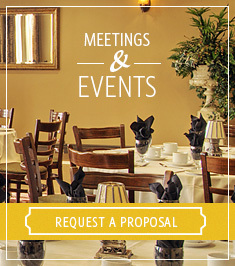 If you’d like to learn more about booking your next event at the Windsor Room, please call The Parlour Inn at 1-877-728-4036 or fill out our online request for information form. By getting in touch with us, you’ll be able to tour the facilities or speak directly to one of our conference planners if you desire to.